Below you can view all the homes for sale in the Westchester Lakes subdivision located in Conyers Georgia. Listings in Westchester Lakes are updated daily from data we receive from the Atlanta multiple listing service. To learn more about any of these homes or to receive custom notifications when a new property is listed for sale in Westchester Lakes, give us a call at 404-998-4166. Finished Basement With 2 Bedrooms, Full Bath, Fireplace, Deck Access, And A Custom Bar! Newer Roof And Ac Unit. MLS#6539706. Mark Spain Real Estate. All 4 Bedrooms, A Full Bath, And A Powder Room Are Located On The Main Level. MLS#6532065. Algin Realty, Inc..
All On A Full Basement! *Stock Photos* MLS#6519663. Keller Wms Realty Atl Metro E.
Immaculate One Owner Custom Built In Upscale Neighborhood - 4Br/3Bath - Formal Dining Room - Formal Living Room - Family Room With Built-Ins - Gorgeous Updated Kitchen With Granite Counter Tops, Practically New Appliances And Huge Pantry - Large Master Suite On Main Level With Updated Master Bath, Garden Tub, Separate Shower, His & Her Closets -Split Bedroom Plan - Two Secondary Bedrooms On Main Floor - 4Th Bedroom With It'S Own Bath Upstairs Which Could Be In-Law/Teen Suite -Laundry Room With Built In Ironing Board And Also Has Sink - Manicured Corner Lot With Patio For Entertaining - Swim/Tennis Is Optional But Not Mandatory - Absolutely Move In Ready MLS#8542517. Deon Cannon Realty. Great Home On Premium Lake Lot.5Bd&4.5 Bath,Full Basement.Needstlc.2 Story Foyer &Formal Dining.2 Story Family Room-Wall Of Windows Overlooking Lake.Kitchen-Hardwoods,Island W/Cooktop,Double Ovens,Bartop.Keeping Room-Abundance Of Windows To Enjoy Backyard And Lake.Owner'S Suite On Main-High Trey Ceiling & Bay Windows Facing Lake.Owners Bath Has Large Walk-In Closet,Tile Floors,Dual Vanities,Jetted Tub,Toilet Room&Tiled Shower.Upstairs Has 3 Bds&2Bas With Large Closets.Partially Finished Basement With 1Bd/1Ba&Rec Room. Lakefront With Fishing Dock MLS#6511796. Keller Williams Realty Atlanta Partners. To See This Home Is To Fall In Love With The Finished Basement That Offers A Full Bathroom, A Bedroom, An Office, Workout Room And 2 Additional Large Areas To Use At Will. MLS#6511293. Bridgewell Realty Inc. Commissions Are Paid Off The Sp Minus The Buyers Premium. MLS#8520133. Dickson Realty Group, Inc..
Best Of All This Wonderful Home Includes An In-Law Suite On The Terrance Level With Living Room, Bedroom, Bathroom & Kitchen. Must See! MLS#8509671. American Realty Pro Of Ga. 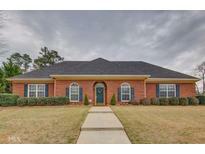 Convenient To Shopping, Schools And I-20. MLS#8502405. Carter'S Galaxy Of Homes. Full Finished Basement Has Open Area For Entertainment + Huge Bedroom, Full Bath & 3 Large Closets + Add'L Storage Throughout. MLS#6085586. Bhgre Metro Brokers.